In Melbourne, a small contingent of exiled West Papuans was able to speak openly about the atrocities being committed in their homeland by Indonesian forces, as part of the Black Lives Matter movement. Attendees marched in solidarity with members of different communities to embrace the campaign for justice over murders committed against black people in related communities. “The situation that is happening in the United States, the violence against the African Americans, we have seen that same thing happening in West Papua. Many peaceful activists are being faced with brutal military police violence,” Ronny Kareni, a West Papuan activist living in Australia, told BuzzFeed News. Kareni led the West Papuan protest at the Melbourne BLM rally and said the movement resonated heavily with the West Papuan community living in Australia. 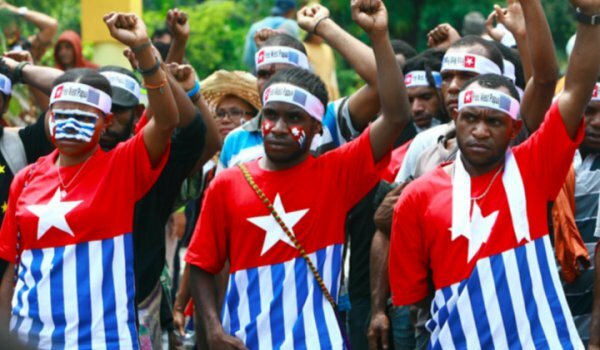 West Papua, a province of Indonesia, is Australia’s closest neighbour but most Australians know very little about its Indigenous Melanesian peoples’ fight for independence. In the past, Indonesia has been singled out by International human rights organisations like Amnesty International and Human Right Watch for violence against the Indigenous population. “Australia is complicit in turning a blind eye to the human rights atrocities that are being committed by the Indonesian security forces. Especially with the killing of young men and women in the community, they face violent behaviour if they take a stand against violence,” Kareni said. More BLM rallies are planned for Perth and Brisbane this weekend.